reading texts in English that you might well normally read in your own language e.g. jokes, personality tests, lateral thinking games, wordsearches. 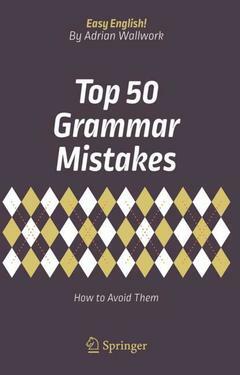 Part I Top 50 Grammar Mistakes.- Part II Revision Tests. Since 1984 Adrian Wallwork has been teaching English as a foreign language - from General English to Business English to Scientific English. Although he lives and works in Pisa (Italy), through his university work he has taught students of all nationalities. Adrian is the author of over 30 textbooks for Springer Science + Business Media, Cambridge University Press, Oxford University Press, the BBC, and many other publishers.